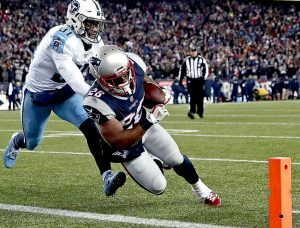 The Titans came back from an 18-point deficit in the second half to beat the Chiefs 22-21 in the wild-card round last week — the largest comeback on the road in the Super Bowl era. But the Patriots didn’t give them a chance for an encore. Davis added an 11-yard TD reception with 1:55 left in the game — and the Titans’ season. The Titans had 85 penalties in the regular season — the second-fewest in the NFL.